For the biblical scholar, see Gerald H. Wilson. Gerald Stanley Wilson (September 4, 1918 – September 8, 2014) was an American jazz trumpeter, big band bandleader, composer/arranger, and educator. Born in Mississippi, he was based in Los Angeles from the early 1940s. In addition to being a band leader, Wilson wrote arrangements for many other prominent artists including Duke Ellington, Sarah Vaughan, Ray Charles, Julie London, Dizzy Gillespie, Ella Fitzgerald, Benny Carter, Lionel Hampton, Billie Holiday, Dinah Washington, and Nancy Wilson. Wilson was born in Shelby, Mississippi, and at the age of 16 moved to Detroit, where he graduated from Cass Technical High School (one of his classmates was saxophonist Wardell Gray). He joined the Jimmie Lunceford orchestra in 1939, replacing its star trumpeter and arranger Sy Oliver. While with Lunceford, Wilson contributed numbers to the band's book, including "Hi Spook" and "Yard-dog Mazurka", the first being influenced by Ellington's recording of "Caravan" and the latter being a big influence on Stan Kenton's famous signature tune "Intermission Riff". During World War II, Wilson also performed for a brief time with the U.S. Navy, with musicians including Clark Terry, Willie Smith and Jimmy Nottingham, among others. Around 2005, many of the members of the band reunited as "The Great Lakes Experience Big Band," with Wilson conducting and Ernie Andrews making a guest appearance at the invitation of Clark Terry. Wilson also played and arranged for the bands of Benny Carter, Duke Ellington, Count Basie and Dizzy Gillespie. Wilson formed his own band, with some success in the mid-1940s. In 1960, he formed a Los Angeles-based band that began a series of critically acclaimed recordings for the Pacific Jazz label. His 1968 album California Soul featured a title track written by Ashford & Simpson, as well as a version of The Doors' hit "Light My Fire". Musicians in the band at various times included lead trumpeter Snooky Young, trumpet soloist Carmell Jones and saxophonists Bud Shank, Joe Maini, Harold Land, Teddy Edwards, and Don Raffell. The rhythm section included guitarist Joe Pass, Richard Holmes (organist), vibists Roy Ayers and Bobby Hutcherson, and drummers Mel Lewis and Mel Lee. Wilson's wife of more than 50 years, Josefina Villasenor Wilson, is Mexican-American, and a number of his compositions showed his love of Spanish/Mexican themes, especially "Viva Tirado", which later became a hit for the rock band El Chicano. Along with his wife, Wilson had three daughters (Jeri, Lillian (Teri) and Nancy Jo), his son Anthony (who is guitarist for Diana Krall), and a number of grandchildren, all of whom have songs composed for them - his compositions were often inspired by his family members. Wilson continued leading bands and recording in later decades for the Discovery and MAMA labels. Recent musicians included Luis Bonilla, Rick Baptist, Randall Willis, Wilson's son-in-law Shuggie Otis and son Anthony Wilson (both guitarists); his grandson Eric Otis also played on such recordings. Wilson continued to record Spanish-flavored compositions, notably the bravura trumpet solos "Carlos" (named for Mexican matador Carlos Arruza, and recorded three times over the years, featuring trumpeters Jimmy Owens, Oscar Brashear, and Ron Barrows) and "Lomelin" (also named for a matador—Antonio Lomelin—and recorded twice, with solos by Oscar Brashear and Jon Faddis). The National Endowment for the Arts named Wilson an NEA Jazz Master in 1990. In 1998 Wilson received a commission from the Monterey Jazz Festival for an original composition, resulting in "Theme for Monterey", which was performed at that year's festival. In later years, he formed orchestras on the West and East coasts, each with local outstanding musicians. He also made special appearances as guest conductor, including with the Carnegie Hall Jazz Band (now the Jon Faddis Jazz Orchestra of New York), the Lincoln Center Jazz Orchestra, the Chicago Jazz Ensemble and European radio jazz orchestras, conducting the BBC Big Band in 2005. He hosted an innovative show, in the 1970s, on KBCA in Los Angeles, which was co-hosted by Dennis Smith, where he played " . . . music of the past, the present, and the future." Wilson was a member of the faculty at California State University, Los Angeles and the University of California, Los Angeles, for many years recently winning a "teacher of the year" award. In the 1970s he also served on the faculty at California State University, Northridge, where he taught Jazz History to wide acclaim among the student body, and has also taught at Cal Arts in Los Angeles. "Garbed in well tailored suits, his long white hair flowing, Wilson shaped the music with dynamic movements and the elegant grace of a modern dancer. Asked about his unique style of conducting by Terry Gross on the NPR show Fresh Air in 2006, he replied: It's 'different from any style you've ever seen before. I move. I choreograph the music as I conduct. You see, I point it out, everything you're to listen to.'" In June 2007, Wilson returned to the studio with producer Al Pryor and an all-star big band to record a special album of compositions originally commissioned and premiered at the Monterey Jazz Festival for the festival's 50th anniversary. Wilson had helped lead celebrations of the festival's 20th and 40th anniversary with his specially commissioned works (1998's Grammy-nominated album Theme for Monterey). The album Monterey Moods was released on Mack Avenue Records in September 2007. In September 2009, Wilson conducted his eight-movement suite "Detroit", commissioned by the Detroit Jazz Festival to mark its 30th anniversary. The work includes a movement entitled "Cass Tech" in honor of his high school alma mater. In 2011, his last recording was the Grammy nominated "Legacy"
Wilson died at his home in Los Angeles, California, on September 8, 2014, after a brief illness that followed a bout of pneumonia, which had hospitalized him. He was 96 years old. Gerald Wilson And His Orchestra 1945-1946 (Classics #976) CD - note: recordings made for the Excelsior, and Black & White labels. Gerald Wilson And His Orchestra 1946-1954 (Classics #1444) CD - note: recordings made for the Black & White, U-A-R, Excelsior, and Federal labels. Gerald Wilson And His Orchestra On Jubilee 1946-1947 (Sounds Of Yesteryear #966) CD - note: two live radio broadcasts. Big Band Modern (The Jazz Factory #22880) CD - note: live material recorded 1950 and 1954. You Better Believe It! (Pacific Jazz Records #PJ-34, 1961) - featuring Richard "Groove" Holmes on Hammond B-3 organ. On Stage (Pacific Jazz #PJ-88, 1965) - note: this is actually a studio album...not a live performance. The Best Of Gerald Wilson And His Orchestra (Pacific Jazz #PJ-20174, 1970; reissue: United Artists #UA-LA-889, 1978) compilation of Pacific Jazz material. The Complete Pacific Jazz Recordings Of Gerald Wilson And His Orchestra (Mosaic Records #MD5-198, 2000) - note: includes all the material (10 albums worth) that Gerald's big band recorded during the 1960s decade. Gerald Wilson...The Artist Selects (Blue Note/EMI #31439, 2005) compilation of Pacific Jazz material. You Better Believe It!/Moment Of Truth (American Jazz Classics #AJC-99070, 2013) - note: two albums-on-one CD; newly remastered with one bonus live track from 1954, "Sea Breeze". 1 2 3 4 5 Don Heckman, "Gerald Wilson dies at 96; multifaceted jazz musician", Los Angeles Times, September 8, 2014. 1 2 Richard S. Ginell (2011). "Gerald Wilson Biography". allmusic. Retrieved 16 July 2011. 1 2 3 Peter Vacher, "Gerald Wilson obituary", The Guardian, 15 September 2014. 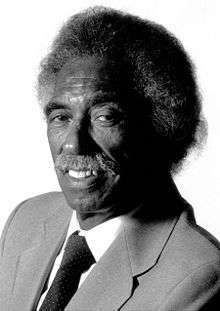 1 2 William Yardley, "Gerald Wilson, Versatile Jazz Arranger, Is Dead at 96", The New York Times, September 9, 2014. 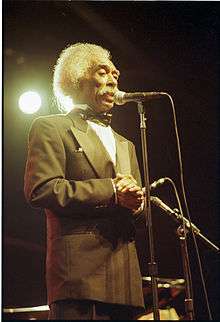 Wikimedia Commons has media related to Gerald Wilson. Interview of Gerald S. Wilson, part of Central Avenue Sounds Oral History Project, Center for Oral History Research, UCLA Library Special Collections, University of California, Los Angeles. Don Heckman, "Gerald Wilson dies at 96; multifaceted jazz musician", Los Angeles Times, September 8, 2014.